Helen Frances Daugherty, age 75, widow of John O. Daugherty, passed away Saturday, October 27, 2018 at home in Georgetown. She was born December 2, 1942, to the late Harry and Ruth J. Kidwell Cook, in Georgetown. 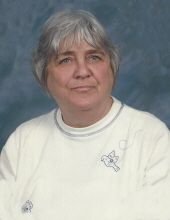 Helen was a former secretary to Gano Avenue Baptist Church, a former office employee to Mallard Pen & Pencil Company and a member of Safe Harbor Baptist Church. She was an avid bird watcher. Helen is survived by her son, Robert Cook Daugherty and her brother Orville (Mattie) Cook, both of Georgetown. She was preceded in death by her brother, Charles William Cook. Helen's visitation will be Wednesday, October 31, 2018 at Tucker, Yocum & Wilson Funeral Home from 11:00 am until time of the service at 2:00 pm. Services will be conducted by Rev. Andy Waldroup and Rev. Sherman Ramsey. Burial will follow the service at Georgetown Cemetery with pallbearers being Ricky Cook, Andy Daugherty, Bobby True, Robert Eads, John Hill II and Robert Dunn. Honorary bearers will be Herman Kidwell, Carey Hall and Howard Covington. To send flowers or a remembrance gift to the family of Helen Frances Daugherty, please visit our Tribute Store. "Email Address" would like to share the life celebration of Helen Frances Daugherty. Click on the "link" to go to share a favorite memory or leave a condolence message for the family.